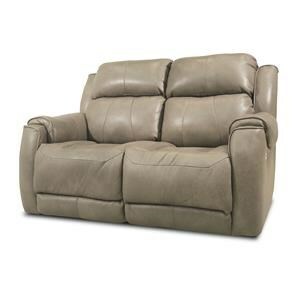 Add an excess of comfort to your living room or home theater with this power reclining loveseat. 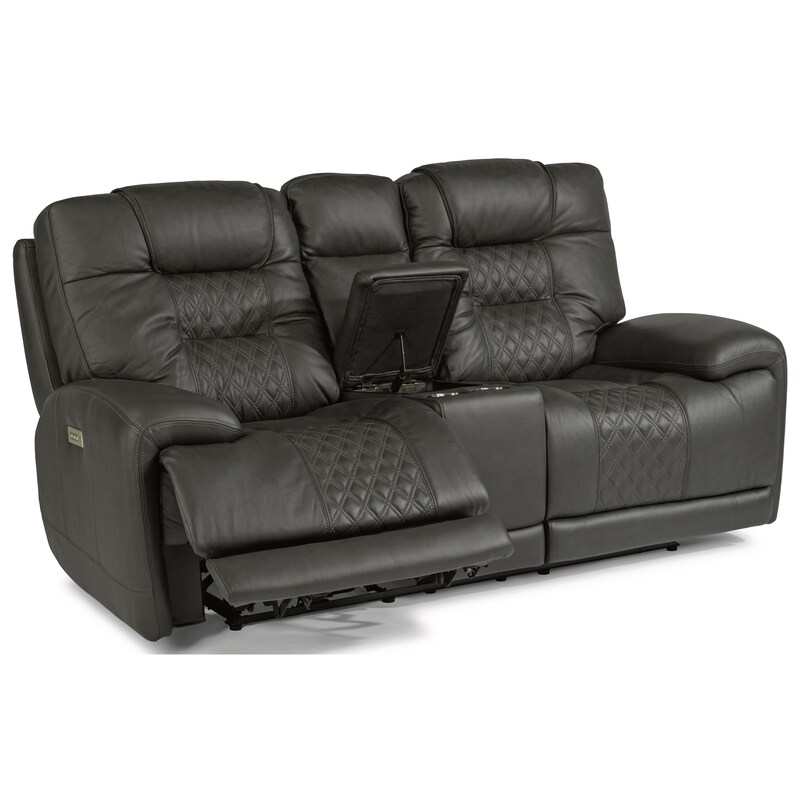 The power headrest, lumbar, and reclining mechanism make it easier than ever for you to find the most comfortable position for you to sit back and watch your favorite movie. 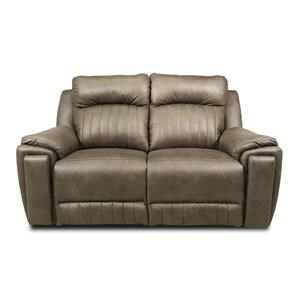 The plush seat back, pillow arms, and high-density seat cushion create a seat that envelops you in comfort. A center console with two cup holders and storage ensure your drinks and remotes will never be out of reach. The free MyRecline F4 mobile app allows you to use your phone to program memory positions for the loveseat and to use your device as a wireless remote control. 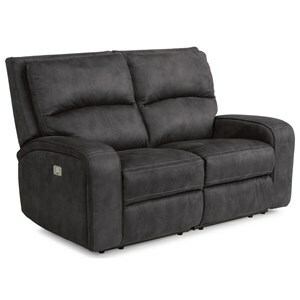 You'll never have to worry about your mobile device running out of battery while you're in this loveseat thanks to the USB port included on the power button control. This loveseat requires 8" of wall clearance. The Latitudes - Royce Contemporary Power Reclining Loveseat with Console and Power Headrest by Flexsteel at Ruby Gordon Home in the Rochester, Henrietta, Greece, Monroe County, New York area. Product availability may vary. Contact us for the most current availability on this product. Fabric Options Available in cover(s) shown. Recliner Mechanism Three power buttons allow you to operate the reclining, headrest, and lumbar mechanisms independently. Add an excess of comfort and some contemporary style to your living room with a selection from this power reclining collection. 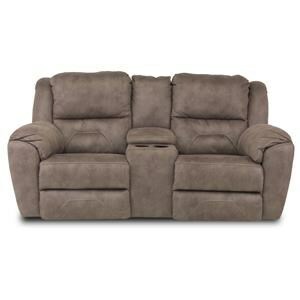 Power headrests, lumbar, and reclining mechanisms make it easier than ever for you to find the most comfortable position possible. 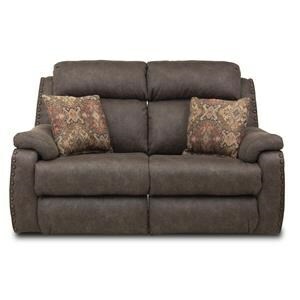 The plush seat backs, pillow arms, and high-density seat cushions create seats that envelope you in comfort. The free MyRecline F4 mobile app allows you to use your phone to program memory positions for these items and to use your device as a wireless remote control. You'll never have to worry about your mobile device running out of battery while you're in this any of these pieces thanks to the USB ports included on the power button control. The Latitudes - Royce collection is a great option if you are looking for Contemporary furniture in the Rochester, Henrietta, Greece, Monroe County, New York area. Browse other items in the Latitudes - Royce collection from Ruby Gordon Home in the Rochester, Henrietta, Greece, Monroe County, New York area.